The Ro-Wing utilizes a monorail track and tubular rigger. The rail is stiff and light and designed so the tracks are protected along each side. This feature allows for unlimited variations of mounting this system in a boat as the wheels do not ride below or above the monorail. There are six ball bearing wheels; four are load carrying and two are captive. We guarantee you will not find a smoother, truer-tracking or quieter sliding seat for any price. The rigger plate is bolted to captive nuts on the bottom of the monorail. The result is an extremely stiff rigger system. The Concept II oarlocks are molded of fiberglass reinforced nylon and incorporate an adjustable locking gate. The locks swivel on a custom screw-machined stainless steel pins. The pins attach to the rigger tube by means of rigger “knuckles”. This system produces a rigid non-slip fixture fully adjustable for load (spread between locks), fore and aft pitch (for blade control), and height. The foot stretchers (foot pads) are independently adjustable for each leg infinitely along the length of the monorail. The foot plates are also adjustable for height (depth below seat) and foot size. The Ro-Wing will comfortably fit children to seven foot tall rowers. 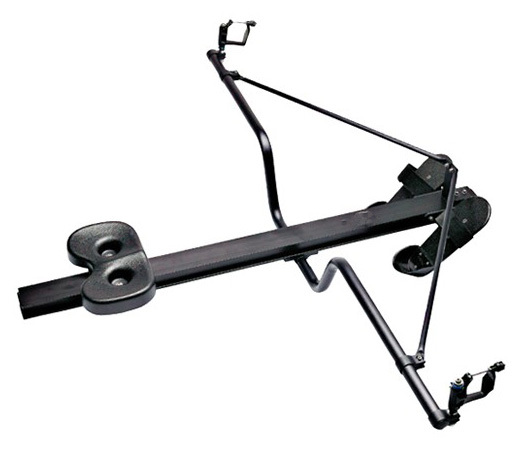 The Ro-Wing Canoe Adapter Kit is uniquely suited for converting canoes into sliding seat sculling boats. The gunwale clamp is 2″ section of ‘C’ shaped aluminum. It has been designed to ring whatever gunwale rails are encountered and compress on the hull. Clamp foot-pads are provided in angled sets to accommodate various gunwale angles. The pads are fitted with thin rubber cushions with an extremely high coefficient of friction. The clamps will not slip or twist nor will they mar your hull. This system is not meant to support your weight on the gunwales. At either end of the monorail are leveling legs with padded feet which are height adjustable. They make up the distance between the bottom of the monorail and the floor of your hull, thus supporting your weight.